Tourism is boosted by the natural elements which favour this area. Sunshine lasts throughout the year. There is a total absence of humidity. The sea and mountains blend into the stunning scenic beauty and of course the famous medicinal natural mineral waters add the final touch in making this a tourist heaven. 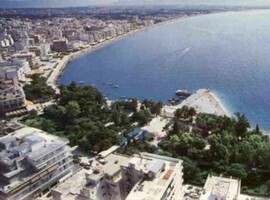 Loutraki covers 300.000 acres and its local population is about 21.000 people. This increases dramatically during the summer holiday months to almost 100.000 people, making it one of the most popular tourist destinations in Central Greece. 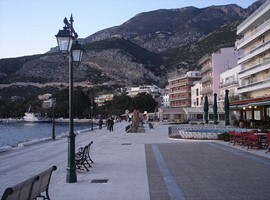 Loutraki has some exclusive tourist features. Since ancient times, the natural thermal springs of Loutraki have been known as “The Water of Life”. These natural springs are caused by faults in the Earth’s crust which are found in a 750 mile wide area along the coast. The waters in these geothermal hot springs rise up from deep under Mount Geraneia bringing healing properties with them. Unlike ancient times, tourists can now treat themselves to balneology, spa treatments and well being sessions in the luxurious modern day Loutraki Thermal Spa. There are a large number of exciting tourist itineraries in this area. 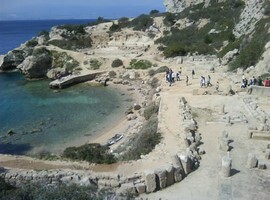 Daily tour schedules include the Heraion lighthouse and the Isthmus canal. The ruins of Krommyona in Ag, where the statue of Apollo once lay, are also on the schedules. If you want more, you can visit the Ancient Corinth temple and museum, experience the Epidaurus Ancient Theatre, the Mycenaean Tombs and the Nemea Ancient Stadium. Ensure you give yourself enough time to see all these idyllic locations! The Isthmian Museum is a must when you are touring around the Isthmian Archaeological Site. This famous museum was built by the Greek architect, Pavlos Mylonas in 1970 and was opened to the public in 1978. Inside the museum, you will find two chambers, explore them both! 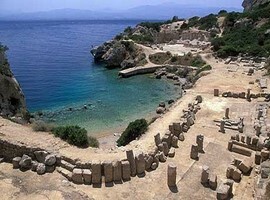 Priceless cultural relics and archaeological remains of the ancient Greek civilization are displayed here. Findings from the excavations of Isthmia and Kehrees can be seen too. Kehrees was the second most important port in Ancient Corinth. The museum also exhibits stunning relics from the Ancient Temple of Poseidon and Palaemon as well as the Hellenistic site of Rahi. Ancient Corinth was naturally situated with a geographical advantage of having two harbours, Lechaion on the east and Kehrees on the south. This made it one of the richest cities of ancient times. It is believed that people first settled in Ancient Corinth at the end of the 5th millennium B.C. Aletes, leader of the Dorians, was recorded as the first king of Corinth. The Dorians occupied this area during the period of 1000-900 B.C. At the southern most end of mount Geraneia, near to the Corinthian Refineries, you will find the historic volcano of Sousaki. Sousaki is a dormant volcano, and although it sleeps through history, but still emits hot scorching fumes. You can get to the volcano of Sousaki by crossing through the olive trees on a short rough path. The landscape will remind you of the lunar surface, sulphur fills the air and the mountain slopes are covered with strange looking stones. In ancient times, we are told, according to Xenofontas, this area held the settlement of Sidous, and was famous for its apple trees. The Geraneia mountains and surrounding areas are part of the Natura 2000 program which is a plan to preserve the natural heritage of Europe. The Geraneia mountains extend from the valley of Megara to the Heraion Lagoon. 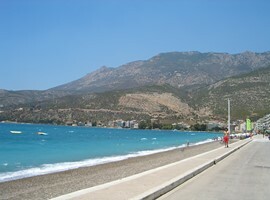 Surrounding the mountains are the Corinthian, Saronic and Alkyonides gulfs. This area is rich in both animal and plant species. Over 950 different types of plants have been identified, some being very rare. Pine trees and bushy vegetation are also a feature of this region. Animals are in abundance here. Jackals, hares, foxes and falcons are amongst the many one can see. 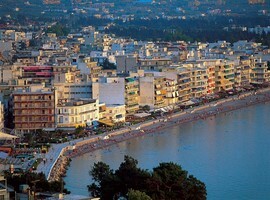 The magnificent Loutraki beach has been awarded the “Blue Flag” continuously since 1987. This award means that it meets the strict criteria set by the non-government, non-profit organization, the Foundation for Environmental Education (FEE). Loutraki beach is very close to Athens and is always buzzing with both locals and tourists enjoying the crystal clear water. Suntan on the pebble beach, have a refreshing drink from the tavern or take a swim in the clear blue sea. If you want something more challenging, try out some water sports; windsurfing, jet-ski or sailing all happen here for those brave enough! You may even get a glimpse of the dolphin that appears near the coast from time to time, watch out for him! Another ideal tourist destination spot is the city of Agioi Theodoroi, just an hour’s drive from Athens. 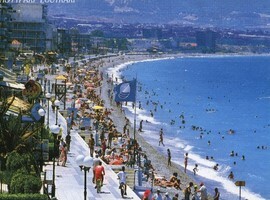 Here you will find lovely beaches with beach bars and cafés. 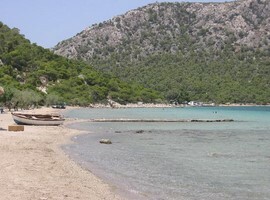 Pefkonas beach is one of the most popular beaches in this area. 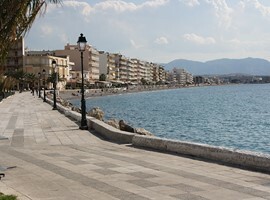 The coastal road approaching the city offers stunning views of the Saronic Gulf. Agioi Theodoroi offers the perfect venue for a family holiday. The beach is crystal clear and safe, the city offers night-clubbing by the sea and the main square becomes a colourful centre of activities for old and young alike during the summer holiday season.